Your Hair Colour is an Important Statement! L’Oreal’s high quality products give a deeper, truer colour with more shine and better condition. At Trimmers we use a variety of hair colouring techniques including, balayge, ombre and highlights. At Trimmers we have two L’Oreal colour specialists, Lauren and Adele. Who both have a degree in colour and passed with a credit of over 90%. They graduated in London 2016. All our stylists are regularly sent on the latest courses at the L’Oreal Academy Manchester. In 2016 we introduced Smart Bond into the salon, Smart Bond is a unique system that protects and strengthens the hair during colouring services. For hair types such as damaged and sensitised hair, leaving reinforced, softer and shiner. At Trimmers we believe that with the continuous training, and development of our salon stylists is a major reason of the popularity of the salon, and its impressive client list. 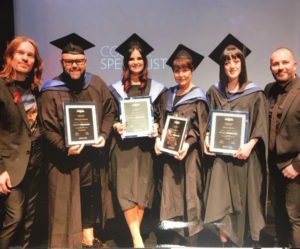 Trimmers Hair have two L’Oreal Colour Specialists, who have been trained to the highest standards in colour knowledge and techniques, such as Balayge, Ombré and free hand painting. We like to offer the very best personalised colour to our clients and this Colour Course has helped Trimmers Hair to take that to another level. 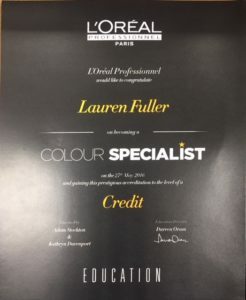 Adele completed her L’Oréal colour specialist course with 90% credit and Lauren completed with 91% credit. This took 15 weeks at the L’Oreal Academy, Manchester. They both enjoyed meeting new people, and now have more confidence in the salon, to make the right choices and delight clients by exceeding their needs. They both now have a better understanding of the technology behind the colours. 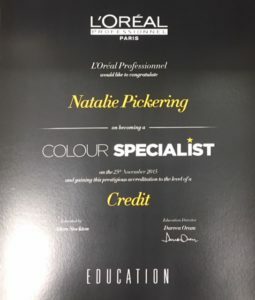 This L’Oreal professional qualification covers every aspect of colouring, from assessing colours to colours that compliment skin tones, to correcting past colour mishaps. The girls have now brought their new colour knowledge back to the salon, which is a great help with our other staff members on our regular training nights. We use the full colour range of L’Oreal, including ‘Colourful Hair’, ‘Metallics’, ‘Majirel Contrast’ and ‘High Lifts’. Majirel hair colouring system offers a rich, permanent hair dye which provides perfect coverage of grey hair. With the expertise of your hair colourist and an in-depth colour consultation, you can achieve your perfect shade. Majirel has over 100 shades that can be tailored to create exactly the colour you are looking for. Dia Richesse Hi-Visability is an ammonia-free, low commitment colour with reflects so shiny and visible even on dark hair. Dia Richesse is our tone on tone, semi permanent colour and is a rich formula with a great blending coverage. Our complete hair lightening product range – Blone Studio – allows for the most on-trend looks on any hair type, from highlights to balayge to blonde. 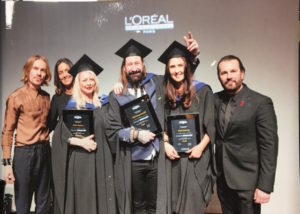 Summarising their experience, the girls said the L’Oreal professional colour specialist course was one of the most challenging aspects of their career in hairdressing to date. It has certainly strengthened their skills and given them great confidence to tackle any hair colouring situation. Book a Free Colour Consultation now with one of our L’Oreal trained experts, on 01695 721414.